While many opponents of the Comcast/Time Warner Cable merger were setting off fireworks last Friday to celebrate the defeat of this deal that would have concentrated nearly 60% of the nation’s high-speed broadband accounts under one company, realists among us are pointing out that the end of that ill-fated engagement does nothing to change the already dismal competition landscape in many markets. 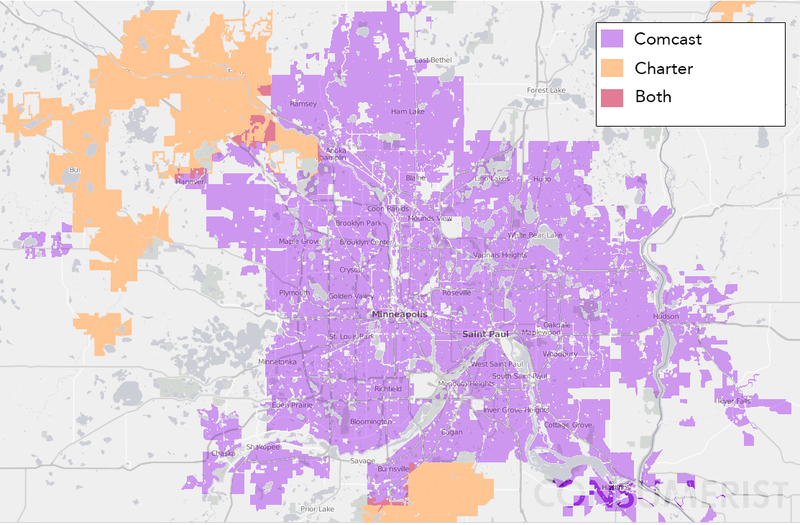 Last year we used maps to show how little competition there is for cable and broadband customers in many U.S. markets where consumers often have one choice for affordable high-speed Internet access. A subsequent FCC report confirmed that only 36% of the country has two or more choices for broadband, and fewer than 10% have three or more options. And as we showed with the case of one Washington state homeowner, sometimes the government data shows that you have multiple options for wired broadband when in fact you have none. The end of the Comcast/TWC merger doesn’t make the broadband market more competitive. Even if you were to break Comcast up into the companies it acquired over the years to get to its current size, competition would still be effectively nonexistent. That’s because most cable providers have exclusivity deals in the areas they operate. So even if you were to shatter Comcast into 100 smaller operators, each would likely still be the sole broadband choice for consumers in their respective market.